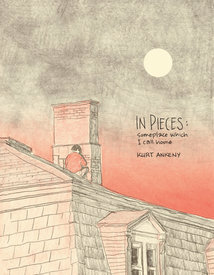 In Pieces: Someplace Which I Call Home is Kurty Ankeny's debut graphic novel. It's 120 pages are filled with crisp, clear, pencil renderings of scenes drawn from life and memory which together weave a hybrid form of graphic novel; part observed, part recalled, part created. In Pieces uses this works to get at the natural rhythms that make up day-to-day life. Parts were serialized up at Comics Workbook, which is worth checking out to get an idea of what this is about, but the work has a very different – colder, harsher – feel online compared to the printed version, which is simultaneously warmer and sharper, while also being much more intimate, and just plain better, all around.